"My paintings are my reaction to the inner life of my subject. I often pray before I paint in order to capture the subject's beauty, subject and style. I have anexpressive style of art using confident and unexpected colors and textures." Although most of the painting subjects shown here were of my own choosing, I do commission work and would be happy to discuss this with you. Most of the paintings you see here are for sale. Some are in gallaries. Please contact me for information on specific paintings. 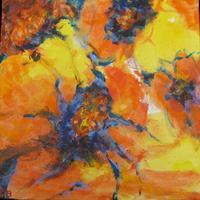 I hope you enjoy browsing through the many colorful paintings on this site.